Be the first to share your favorite memory, photo or story of Irma. This memorial page is dedicated for family, friends and future generations to celebrate the life of their loved one. 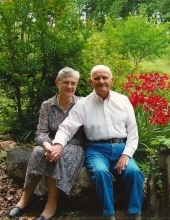 Seneca–Irma “Gene” Childs Dickerson, 93, widow of William Pledge Dickerson, of 330 Pickens Mill Road, passed away, March 28, 2019, at her residence surrounded by her loving family. Born in Oconee County, SC, she was the daughter of the late Claude McGee Childs and Junie Jaynes Childs. Mrs. Dickerson worked in the spinning department at JP Stevens in Clemson having retired after 37 years. Gene was a charter member of Snow Creek Baptist Church, where she was active in WMU, a long time Sunday school teacher, and the church pianist. Survivors include a son, James Morris Dickerson (Wanda) of Seneca; daughters, Carolyn Henderson (the late Raymond Henderson) of Seneca, Shelby Sheriff (Herschel) of Seneca, and Frances Miller (Jerome) of Seneca; eight grandchildren, fifteen great-grandchildren and three great-great grandchildren. In addition to her husband and parents, she is preceded in death by brothers, Calvin, Harry, Louie, and Clinton Childs; sister, Clara Stone and a half sister, Margaret Childs; grandson, David Morris Dickerson; two great-grandchildren, Allie and Taylor Sheriff. A funeral service will be held at 3 pm, Saturday, March 30, 2019 at the Sandifer Funeral Home Chapel with burial to follow at Oconee Memorial Park. The family will receive friends 1:30 – 2:45 pm, prior to the service at the funeral home. To send flowers or a remembrance gift to the family of Irma Gene Dickerson, please visit our Tribute Store. "Email Address" would like to share the life celebration of Irma Gene Dickerson. Click on the "link" to go to share a favorite memory or leave a condolence message for the family.